This healthy Greek Salad uses up leftover chicken. Don’t be fooled by its name. It may be called “salad” but this is a main dish as it contains protein and lots of other nutritious ingredients. To make this salad, you can use leftover rotisserie, roasted, bbq or even boiled chicken. My favourite way of making this salad is using rotisserie chicken. When I have other chores to do and there is no time left to cook, my favourite food is to buy rotisserie chicken. I always buy more so that the next day, I use the leftovers to make this salad! 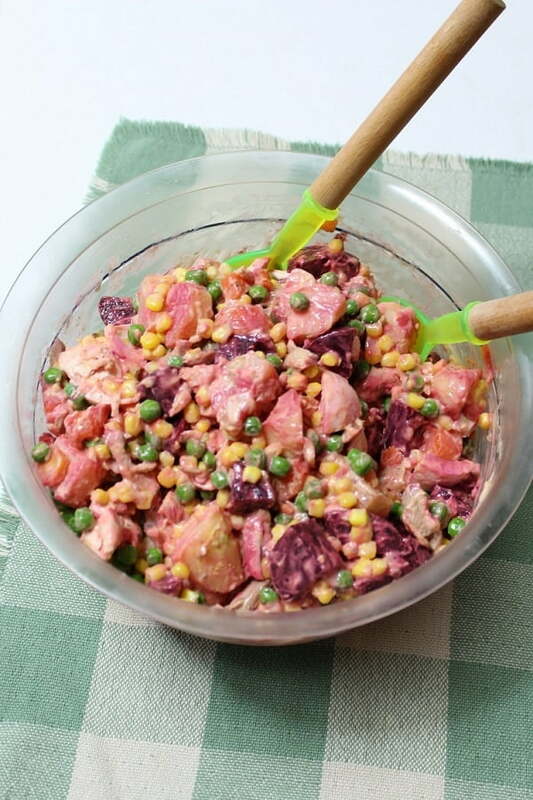 When I first made this salad I did not add any beets nor ketchup in the dressing, but when we tried it this way, we all loved it so much that this is how I make it since then. If cooking everything from scratch, as I do, it will take about an hour and a half to roast the beets in the oven. Simultaneously you can roast the potatoes and the carrots, boil the eggs, the corn and the peas and prepare the salad dressing. However, there are ways of reducing the time. You can find steamed, vacuum packed beets at the supermarket or you can steam the vegetables using the pressure cooker. This method takes about twenty minutes. I’ve made this salad many times with different combination of ingredients and depending on my time I have steamed the vegetables in the pressure cooker as well. I have also used the microwave to roast the carrots and when almost done I also added the peas and corn and cooked them together by adding a couple tablespoons water, so that they do not dry. I am not a very big fan of mayonnaise but occasionaly my daughter asks for some, so whenever there is leftover in the fridge, I usually try to use it after being opened for several days. In this case, I add some in the dressing together with Greek yoghurt, olive oil, mustard, vinegar and ketchup and put them in the food processor, together with the leftover garlic from the carrots and mix them until combined. This healthy Greek Salad uses up leftover chicken. Don't be fooled by its name. It may be called "salad" but this is a main dish as it contains protein and lots of other nutritious ingredients. Remove the skin from the chicken and cut it into small pieces. Roast, boil or microwave the beets, potatoes and carrots. Peel the potatoes while still warm and after cutting them, drizzle with a tablespoon of olive oil. Boil peas and corn for five minutes and drain. Put the eggs in a pot, cover with water and bring to a boil. Lower heat and cook for ten minutes. Put them in cold water for five minutes before peeling them. Peel the vegetables and cut them into small pieces. Season them with salt, pepper and oregano. Add them to the salad, mix and refrigerate for half an hour before serving. A very nice use of leftover chicken, Ivy. The salad looks super delicious. This salad looks so good I definitely won’t wait until I have some chicken leftover to try it!